Not to be confused with World 2-7, Level 2-7, or Area 2-7. 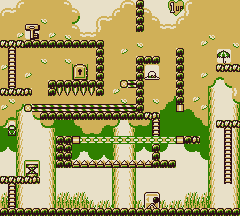 Stage 2-7 is the seventh level of the Forest in the Game Boy version of Donkey Kong. The level is very big and has Dotties and Snipers which can climb walls. Mario starts at the bottom of my the stage where he must go right and pull the Switch when a Dotty is on the platform with the door, causing the door to open and the other creatures to be released by opening the bridge. He must then go left and climb up a Ladder, then Jump onto a Spring so he can get up to the platform with the bridge. He must then avoid Dotties and Snipers while making it over to a platform with a long ladder. Then Mario must jump onto a Dotty then let it carry him up to the top where he can get a 1 UP Heart and make it over to the platform by jumping. Then, Mario must ride some Conveyor Belts to the left while crouching so he doesn't get hit by the Spikes on the ceiling. When there is nothing above him, he must quickly jump onto a platform with a ladder. He must climb up to get to the Key. Mario must grab the key, then go back to the conveyor belts. He must drop the key on them while crouching again, then quickly grab the key at the end. Mario must then jump onto the platform with the ladder, then jump to the platform with the door, which ends the level when Mario enters. Hat: Above the platform with the Ladder connected to the Conveyor Belt. Parasol: On the platform to the right near the thin platform with a Dotty on it. Bag: Above the Spring and below the conveyor belt. This page was last edited on April 10, 2018, at 12:42.